A fun fact about me: I have been reading Gone with the Wind for over a year now and I’m still only halfway through. As an English major and a history junkie, it’s embarrassing. I’m reading in slow-mo. Patrick’s grandmother, a native Georgian, encouraged me to read the book (and then watch the film) after our trip to visit her in Atlanta last summer. The Civil War is very much alive in the city, the former heart of the Old Confederacy and a shining example of the New South. There is so much Antebellum history still standing in Atlanta, despite its burning by both the Confederacy and General Sherman: the old homes with carriage steps out front, the churches left in tact by the Union, and Stone Mountain, the Confederate version of Mount Rushmore. For Atlanta, Georgia, a city at the center of the war, such historical significance is expected. So, I was taken by surprise when the Historical Society of Palm Beach County launched the exhibit By Land & Sea: Florida in the Civil War last September at the Richard and Pat Johnson Palm Beach County History Museum. I had no idea how important my home state was to both the Confederacy and the Union for supplies and military strategy. After passing the museum multiple times driving down Dixie Highway (the museum is located in the Historic 1916 Palm Beach County Court House), P and I finally decided to explore the exhibit on its final day, July 2nd. 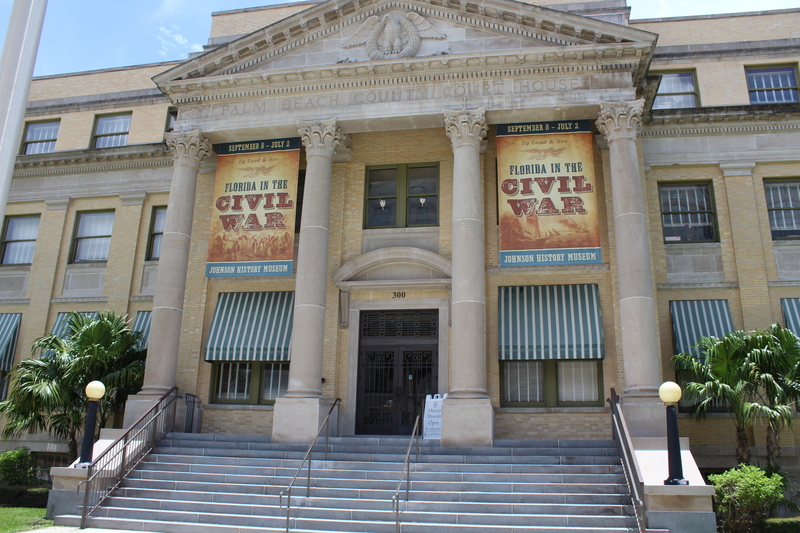 By Land & Sea: Florida in the Civil War exhibit at the Richard and Pat Johnson Palm Beach County History Museum ended on July 2, 2016. Florida was the poorest and least populated state in the Confederacy, with approximately 140,000 residents. Of those residents, 60,000 were slaves. Florida was the third state to secede from the Union, after South Carolina and Mississippi. It is estimated that 16,000 Floridians fought in the war. Most joined the Confederate army but about 2,000 fought for the Union. Florida ports were important exit and entry points for blockade runners (like Rhett Butler!). Union General Winfield Scott’s “Anaconda Plan” was a strategy to subdue the Confederacy by blockading ports of the southern states. Florida’s proximity to Nassau, a major British trading hub, made the state imperative in getting supplies to the Confederate troops. Both the Jupiter and Indian River Inlets were used by the Confederacy to trade products produced in the South, such as cotton, molasses, and whiskey, for war materials, coffee, dry goods, flour, alcohol, and luxury items. A map of the “Anaconda Plan” used to defeat the Confederacy. Florida played a major role in the blockade. With the men off at war, women, children, and slaves kept the farms and plantations running to provide food for the Confederacy. They sent cattle, pork, fish, and fruit north to the army. Salt was Florida’s most important export, as it kept meat from spoiling. Workers set up salt factories along the Gulf and Atlantic coasts to separate salt from the seawater. These factories became targets for Union ships. Tallahassee was the only Confederate capital east of the Mississippi River that was not captured by the Union. Florida was re-admitted into the Union in 1868 after the state constitution was rewritten to ratify the 13th and 14th Amendments (abolishment of slavery, citizenship rights and equal protection of the laws). A rare post-Civil War American flag with only 37 stars. Most flags in this time period were made with 38 stars to anticipate Colorado’s admission into the Union. The 1916 Courtroom, reconstructed to its original layout and paint colors. P watching the imaginary court proceedings. He’s just so stinking cute. You can watch a time lapse video of the restoration of the courthouse here. P and I spent a fun afternoon at the museum and learned quite a few new and surprising tidbits. For instance, I had no idea that, in 1972, a wrap-around addition was built around the original structure and architecture of the 1916 courthouse! This addition wasn’t removed until restoration began in 2004. We recommend the museum to anyone looking for some local history, a break from the beach, air-conditioning, and a glimpse into our county’s past. Our great state of Florida has more historical significance than we are led to believe – it wasn’t always Disney World and retirement communities. Facts contained in this post about both the Civil War and the Court House restoration are from the Historical Society of Palm Beach County’s website: http://www.historicalsocietypbc.org. Thank you so much for sharing your enthusiasm for our Museum! I certainly remember your visit, and enjoyed meeting you. I hope you will come back and see us after September 6, when “For the Love of the Game: Baseball in the Palm Beaches” opens in the gallery that held the Civil War exhibit. Patrick and I had a wonderful time and learned so many new things – the museum is such an asset to our community. Florida’s role in the Civil War was totally new to me–thanks! I remember crying non-stop through about the final third of GWTW when I was in high school. I’m a transplant to Lexington, Kentucky, and have learned that Margaret Mitchell probably (she never would confirm) based the character of Belle Watling on Lexington’s notorious madam, Belle Brezing. Mitchell and her husband lived in Lexington for a time. Hi Karen! Thanks for stopping by! I still have to finish GWTW… I think I’m about halfway through… but I’m looking forward to it! I also can’t wait to learn more about Kentucky from your blog. I have never been to Kentucky! Like you, I love history and preservation, so Kentucky Day Trips is right up my alley!